From the Baldwin County Courthouse, go east on Hancock St. and follow Highways 22/24 southeast for 4.4 miles. Where Highways 22 and 24 split, bear right on Highway 24. Go 7.2 miles. On the left side of the road is a driveway at 816/820 Hwy 24 East. The house is about 1/4 mile from the highway. 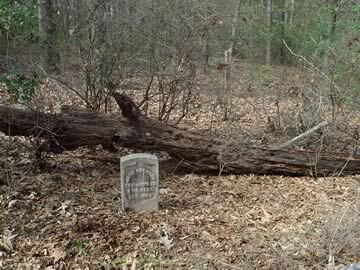 The cemetery is located in the woods about 0.3 mile from the left rear of the house. A guide or GPS is recommended. Rough directions: Park the car and face the house -- then walk for for 0.3 mile out from the back left of the house, at about a 45 degree angle from an imaginary line running straight back from the house. In 2005, one could follow an ATV trail that started at the left front of the house and went back toward the cemetery; where the ATV made a right angle turn to the right, go straight forward for 300 yards to a fence. The grave is along the fenceline. Ask permission to approach the cemetery. Traylor's Co., 2 Va. Regt.